Two security guards from the Masurina Lodge in Alotau were shot by an armed man around 11:30am today outside the BSP bank. “I was in the bank and when I heard the shots. I turned around and I could see one of them with his weapon running around. 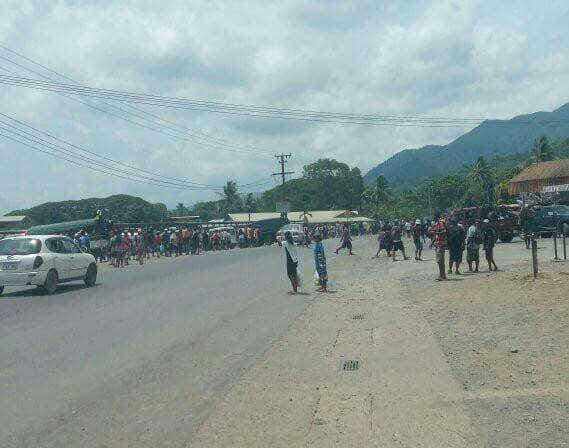 It was revealed that after the shooting, Trobriand islanders retaliated and started throwing stones at the Alotau enterprise shops. “So the police arrived in time to disperse the crowd but were too late to chase after the robbers,” said the eyewitness. The two security guards have been rushed to hospital. Meanwhile, it is still unclear whether money was actually taken by the suspects.